SynchStage is a powerful online video compositing suite that allows you to audition our music with your own uploaded video. Expressly tailored for online video synching, our easy to use interactive software creates a true audio/visual composite, showing exactly what the selected music will look like with any video. You can visually offset the audio against the video, set cue points, control and fade volume levels, clip, edit, save, share, and collaborate with one another across multiple synch projects. Building and sharing synchs online with SynchStage dramatically speeds up the license approval process by enabling key decision makers to literally get on the same page and discuss the potential of a track and video instantly. 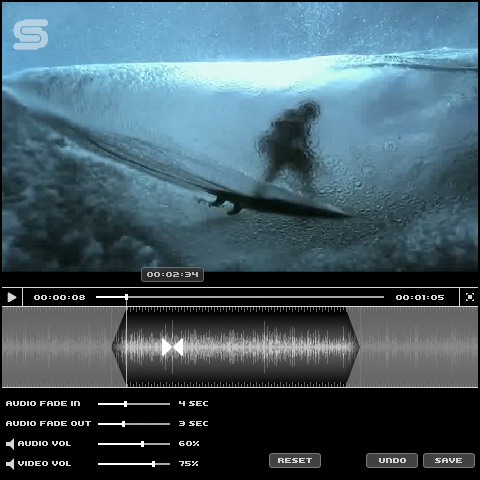 Visually control rendered audio waveform against video playback. Individual track and video volume controls. Set audio and video cue points. Set volume auto fades up and down. Share synchs and presentations with individuals or groups as clients or collaborators. Securely password-protect links for all projects and presentations. Video support for a variety of formats: MOV, WMV, MPEG, AVI, and more. You must login to use SynchStage. Click here to login. After you have logged in, follow the SynchStage link to access SynchStage.